In the 7th round game of Gibraltar Masters Vassily Ivanchuk and Le Quang Liem shook hands for a draw at move 14. The players agreed on the result and signed the sheets without any arbiter. The rules of the comeptition suggest the participants to complete 30 moves in order to be able to offer a draw. 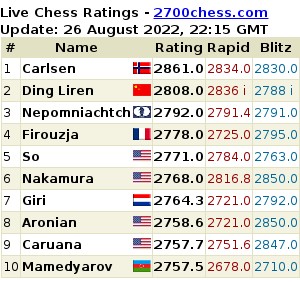 According to Chessdom "This is not the first case of under 30 moves game in Gibraltar. It has happened earlier at lower boards and the players were given the option to start over the game or they were forfeited." As a result the score wasn't changed. "It is like a first warning and we do not want to upset the players," Conquest said. It's not ruled out Vassily Ivanchuk "paid off" the situation by agreeing on holding the Masterclass. It took place yesterday. Ukrainian GM showed two of his games played in late 80's and answered the questions of Conquest and local journalists. In yesterday's round the comeptition got a sole leader: Nikita Vitiugov defeated Kiril Georgiev on Board 1 and at the moment he heads the table with 6.5/7. "When the Brilliant Players Are At the Board"
The third round games of the ACP Golden Classic competition have started at 15.00 Moscow time in Amsterdam. The leader Vassily Ivanchuk is playing with white against Emil Sutovsky. 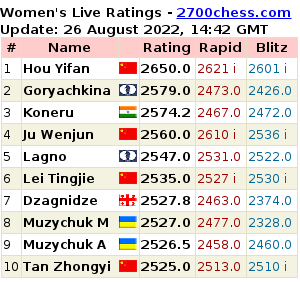 The two players who started unsuccessfully, Baadur Jobava and Le Quang Liem, will fight with black against Anna Muzychuk and Krishnan Sasikiran, respectively. Gata Kamsky has a free day. The World Women's Champion Hou Yifan has surprised the interviewer Stuart Conquest as well as the audience during her masterclass in Gibraltar by saying that she isn't going to play in the FIDE World Women's Championship. Let us remind you that the championship will be held according to the knock-out system in the Russian city of Sochi from March 16th to April 7th.